Agua Azul Badian is a beach resort in Badian Municipality, Cebu Province. This municipality is popular for its natural gifted-ness including waterfalls, rivers, mountains, and forests. Addition to that land treasures, they also have the wealth of the sea and everything in it. If you still remember your Spanish class (native speakers exempted), both ‘agua’ and 'azul’ and Spanish words which mean ‘water’ and ‘blue’ respectively. Yes, we are talking about the biggest body of water on Earth - the sea! And the name of the resort says a lot about their property – “Life is better on the beach! It will help if you are traveling and exploring the world famous Kawasan Falls to include in your itinerary Agua Azul Badian Resort. This resort is not yet common knowledge among travelers and naturalists (I mean those who love nature when they find the time or take a break from their daily busy routines!). Agua Azul Badian resort is the ideal serene abode to regain strength and evenness of mind and get ready to face the real world again. Yes, Agua is excellent for holding activities and having fun with friends, family members. You can also hold an event with your corporate team or a small organization. HINT: This property was once owned by an artist or art hobbyist. So, you would enjoy it all the more if you are into this world of arts! Agua Azul was originally built as a refuge of an art enthusiast. That is why you will apparently notice that the house is built with strikingly gorgeous interior designs and decors that only an artist can imagine and create. This brightly colored rest house is organized with antique wooden furniture custom-made, among more decorative items inside this unique abode. For some reasons that only the owner or an artist can comprehend, the property has been sold to a family. The new owner (Mancao Family) took advantage out of this creatively built house. The new landlord does not only welcome close friends and relatives but also outsiders. That means accepting guests for profit. Agua Azul uses its beautiful advantage as a guest house or resort. Of course, not just anybody. The management prefers referrals – for some reasons. Agua Resort is available an overnight rent (guess long-term rent could be arranged) for the whole property. 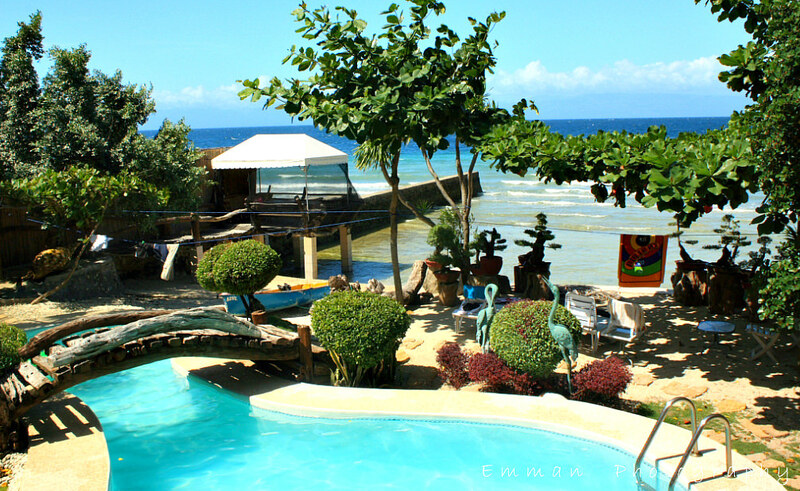 Depending on your arrangements, some guests rented Agua Azul for a fair rate (about 10,000 Pesos) while others had it for a more discounted price. Phone Number available: (032) 254-9246. Since the sea is available, you can use your imagination about activities you can implement in the vicinity. Since not all residents in the area are aware of this property, it could be hard to find it by yourself. But don’t worry too much as most bus drivers (and conduktor – fare collectors) know this house. Just tell them that you are getting off there. You may take a Ceres or Librando bus to reach this area. I am sure that those are satisfactory pointers on how to get there. The process of locating Agua Azul could be already a part of your adventures in Badian Municipality. If you are seriously planning and has successfully visited the place, please share your impressions with us. Hope you have fun travels in life!